#2 & BTR Construction Grade Lumber in Spruce, Pine, Fir and Hemlock. Lumber widths range from 2" x 4" to 2" x 12", stocked in 8' through 20' lengths. We also stock 24' lengths in 2" x 6" through 2" x 12". Recently we have added premium grade pre-cut studs for 8' and 9' walls. These are very popular with contractors and do-it-yourselfers who want the best available product. We've got the lumber you need! Spruce boards #2 and better in widths from 1" x 4" through 1" x 12". 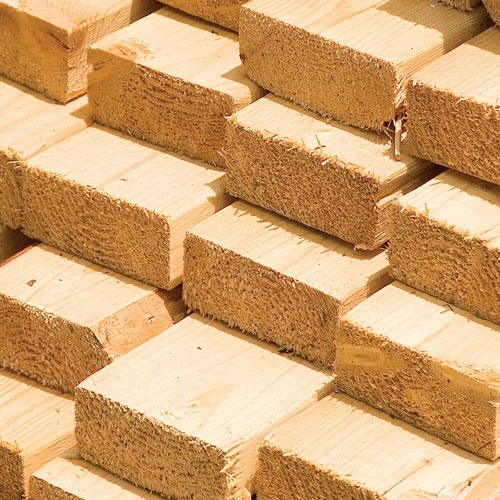 Big L Lumber carries a variety of treated lumber products to use on your project. 4" x 4" poles stocked in 8' through 16' lengths. 4" x 6" poles stocked in 12' through 20' lengths. 6" x 6" poles stocked in 12' through 24' lengths. Wood foundations are becoming quite popular for new homes and additions. The walls can be insulated and finished much easier and cheaper than concrete. Big L stocks .60 treated plywood in 1/2" and 3/4" thicknesses. 2" x 6" and 2" x 8" stud material is also in stock. Big L is a leader in supplying I-Joist Roof and LVL roof and floor systems. Check us out for a great price and quick delivery! **Nominal sizes are used to describe an approximate rather than actual dimension. Nominal sizes were originally derived from dimensions of rough lumber before being surfaced (made smooth, even, and uniform in size and shape) at the mill.